Not every high school student has the opportunity to write their own play and see it performed on stage, but thanks to the support of the Bellingham High School drama program, three BHS students did just that. On Monday, April 25, the BHS drama club put on a night of one-act plays, which included “Please Don’t Be My Drama Teacher,” and “Dry as a Bone,” a play written by three BHS students: Danny Perkins, Meghan Harrington, and Charlie DeFlaminio. Set in the prohibition era, “Dry as a Bone” follows three childhood friends caught in a trap of loyalty as they grow up on different sides of the law. The students had the full support of BHS drama teachers, Samantha Goldenblatt and Joanne Featherston. After a successful performance of Shrek in February, the drama teachers and students were bouncing around ideas for a spring performance. For a change of pace, they wanted to do something that wasn’t a musical. On one of the last nights of the Shrek show, Danny Perkins approached them with a play that he and some friends had written, and they agreed to read it. It didn’t take the drama teachers long to give the project the go-ahead. “Mrs. Featherston called me that night,” Goldenblatt laughed, “and said, ‘It’s great. We’re doing it.’” Though the students were open to changes, they found that not many were needed. A few changes were made to the flow, but not many to the story line, and from that point on, the students took charge. Though the teachers were there to provide assistance, the plays were student directed. The idea for the play came from a summer camp Charlie had volunteered at the year before. Their annual water balloon fight had a prohibition theme, and from there the three friends started thinking about story ideas. While the students collaborated equally, Charlie said the idea to start writing was Meghan’s. “It started as hanging out and telling stories, and slowly we thought it would make a good play, and next thing you know we were writing it,” Charlie said. They had the basic plot for the play within an hour, and the rest of the time was spent fine-tuning and editing the story. While they wrote a lot of the play together, Charlie said he would wake up and have emails from Danny at three o’clock in the morning with ideas for the play. While they didn’t set out to write a play that would be produced, Meghan said they had it on their mind as they wrote. “I think we kind of wrote it for our drama club in particular,” she said. “We were thinking of who would be good to cast for each character.” The drama instructors and students collaborated on the casting, and the results were more than they had hoped for. 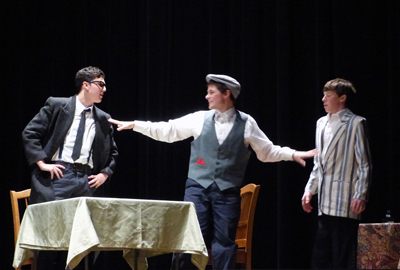 Evan Motta, Danny Perkins, and Nick Geromini (shown L-R) play three friends on different sides of the law during the prohibition era in "Dry As A Bone"